Proposal passes on first reading to allow extra 75 days for budget approval, set biennial budget. Labor MK: budgets are meaningless. After a hearing that lasted for hours into the night, the Knesset plenum approved on first reading the draft of the 2015 State Budget overnight Monday/Tuesday, and decided that the next budget will be biennial - lasting until the end of 2016. 57 MKs supported the budget; 55 opposed. The proposal will be taken to the Finance Committee for preparation for second and third readings of the bill. The proposed budget seeks includes a clause extending the period in which the government must remain intact, even without agreement on the budget, from 100 days to 175 days. Deputy Finance Minister Yitzhak Cohen (UTJ) presented the proposal and explained that the purpose of the postponement is to allow thorough and serious discussion in the Knesset and in order to allow the Finance Ministry to prepare in cooperation with government budget in a professional manner. 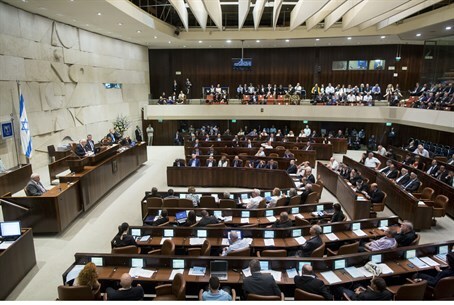 MK Stav Shaffir (Labor) criticized the new measures, claiming that the last government managed to transfer over 64 billion shekel ($) of money not included in the original budget for 2014 via the Finance Committee, thus making the current amendments meaningless. "We know that Israel has a secret budget in the Finance Committee which passes without any supervision," she fired. "Overall we asked for extension of deadlines," Cohen countered. "If something so small merited an overnight discussion, what will happen when we reach major material?"